The CD83 molecule is a known marker of dendritic cell differentiation process, and its soluble form (sCD83) exerts immunosuppressive functions. In our research, we examined whether the sCD83 plasma concentration is impaired in DM1 children and if the expected changes are in line with the disturbed process of monocyte’s transformation into mCD83+ monocyte-derived cells. 28 newly diagnosed (ND-DM1) and 30 long-standing (LS-DM1) patients were enrolled into our study. We revealed that the examined cells show a high mCD83 expression level in ND-DM1, which was significantly downregulated by the TNF-α stimulation. The results were in line with those from healthy controls. We also observed that monocyte differentiation process into CD83+ cells was much defective in LS-DM1 children and the mCD83 expression level seems not to be controlled by TNF-α. Moreover, the sCD83 level was significantly decreased in plasma from LS-DM1 children and it was negatively related to HbA1c levels, while no correlations were observed between TNF-α plasma concentration or disease duration. Summarizing, our results suggest that reduced sCD83 levels may correspond with a poor metabolic control in LS-DM1 patients and therapeutic administration of this molecule may indicate a new therapy approach in the chronic phase of diabetes. Insulin-dependent type 1 diabetes mellitus (DM1) is a progressive, metabolic disorder that results from accelerated loss of pancreatic β-cells and impaired insulin production . This long-standing disease is characterized by a low-grade chronic systemic inflammation , accompanied by formation of leukocyte infiltrations, and impaired blood flow in microvessels and tissue damage. Those effects may contribute to long-term diabetic complication development [3, 4]. 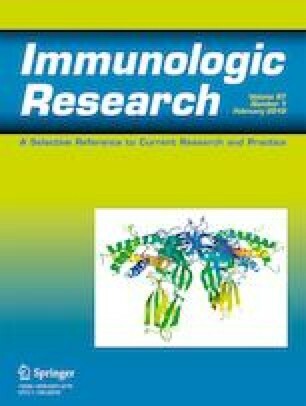 Monocytes, which an enhanced number is observed in peripheral blood of complication-free long-standing DM1 patients [5, 6], when activated, may spontaneously secrete high levels of proinflammatory cytokine, TNF-α [5, 7], and contribute to the progression of the mentioned degenerative process [8, 9, 10, 11]. Three different monocyte subpopulations, according to the CD14 and CD16 surface expression can be distinguished. The main subset is comprised of classical, CD14brightCD16− cells, while the nonclassical subset consists of CD14dimCD16+ monocytes. The phenotype of the least numerous, intermediate population is CD14brightCD16+ . Depending on microenvironment conditions, monocytes may transform into dendritic cells (MoDCs) and augment in vivo the residual myeloid dendritic cell subset . Among the most characteristic markers of differentiated DCs, one can mention a single-chain glycoprotein member of the Ig superfamily [14, 15], the membrane CD83 molecule (mCD83) . It is also expressed by many other immune cells [16, 17, 18, 19, 20, 21, 22] as well as thymic epithelial cells . The mCD83 may be also detected intracellularly in monocytes, macrophages, and immature DCs, but its surface expression may be induced after LPS activation . A soluble form of the CD83 molecule (sCD83) is present in normal human sera [17, 25], and it is generated by a proteolytic cleavage of a membrane-bound form. It may be released by activated monocytes, in vitro generated MoDCs as well as, at low levels, peripheral blood CD1c+ DCs [17, 21]. Ju et al. concluded that mCD83 levels expressed on human DCs have a crucial meaning in the process of stimulation, while monocyte-derived sCD83 is involved in the suppression of excessive immune responses . To date, altered sCD83 plasma levels were identified in patients with early rheumatoid arthritis [26, 27], in some haematological malignancies , or multiple sclerosis . As far as we know, there are no works that present the sCD83 plasma concentration levels in long-standing diabetic children, who are prone to develop microvascular complications. In this work, we aimed to answer if the diabetic process may affect the sCD83 plasma levels in juvenile subjects. As the immunoregulatory defects and altered balance between proinflammatory and antiinflammatory factors in DM1 has previously been observed [30, 31, 32], we suspected that the sCD83 plasma concentration may be impaired in those patients. We also estimated how the proinflammatory TNF-α affects the differentiation process of monocytes into CD83+ cells in PBMC cultures. 58 randomly selected type 1 diabetic juvenile patients (28 newly diagnosed and 30 with long-standing disease) were recruited from the Clinic of Paediatrics, Department of Diabetology and Endocrinology, Medical University of Gdańsk, Poland. The patients with simultaneous vascular complications, hypertension, inflammatory and infectious diseases, or another autoimmune disorder were excluded from the study. Insulin-dependent type 1 diabetes (DM1) was defined in accordance with the American Diabetes Association criteria. In newly diagnosed children (ND-DM1), the blood samples were collected between days 10 and 15 after diagnosis. The control group consisted of 15 (7 girls and 8 boys) healthy individuals. The controls were free of autoimmune and infectious diseases. Plasma was separated after centrifugation (2500 rpm for 15 min) from all the patients and stored at – 20 °C. Glycosylated haemoglobin (HbA1c) was measured at the time of collecting blood. The study was approved by the Ethics Committee of The Medical University of Gdańsk (NKBBN/406/2013) and followed the principles of the Declaration of Helsinki. From all parents of juvenile participants, written informed consent was obtained. General clinical characteristics of examined patients are shown in Table 1. Six ml of venous blood was collected in heparin-containing Vacutainer tubes (BD Biosciences, USA). Peripheral blood mononuclear cells (PBMCs) were isolated by density gradient centrifugation (Histopaque, Sigma-Aldrich, Poland). The PBMCs were cultured in quadruple on 24-well plates at a density of 1 × 106 cells per 1 ml of RPMI 1640 supplemented with 1% penicillin/streptomycin and 5% fetal bovine serum (Sigma-Aldrich, Poland). We used the following pattern of stimulation: 1st and 2nd wells—unstimulated samples; 3rd and 4th wells—samples with addition of TNF-α (BD Biosciences, USA, at the concentration of 10 ng per well). The cells were cultured for 24 and 72 h at 37 °C with 5% CO2. After incubation time plates were washed by cold PBS (without Ca2+ and Mg2+) and kept for 10 min on ice. Well contents were collected and transferred to the cytometric test tubes (BD Biosciences, USA). To remove supernatants, the cells were washed with PBS and centrifuged at 1500 rpm for 7 min twice. To distinguish the CD83+ monocyte-derived population, the PBMCs were suspended in 100 μl of PBS and labelled by monoclonal antibodies against the following surface markers: CD14 (BD Biosciences, APC Mouse IgG2a κ), CD16 (BD Biosciences, APC-Cy7 Mouse IgG1, κ), and CD83 (BD Biosciences, PE-Cy7 Mouse IgG1, κ). The samples were incubated in the dark for 30 min at room temperature, washed with 2 ml PBS, and centrifuged twice (1500 rpm, 6 min). The cells were resuspended in 400 μl PBS and analyzed by using flow cytometry (LSRII, BD Biosciences, USA). The dot-plots’ region including monocyte-derived cells contained typically 4000 of all events. The mean fluorescence intensities (MFI) of CD14, CD16, and CD83 markers were verified. Data were analyzed by FACSDiva software (BD Biosciences, USA). The monocyte-derived cells were identified using expression of CD14/CD16. The cultured CD83+ cells were identified using an SSC/CD83 expression parameter. Gates delineating positive staining were set on the basis of isotype control staining. The plasma concentration of TNF-α and sCD83 in the DM1 patients (n = 58) and healthy controls (n = 15) was quantified using a commercial Quantikine HS ELISA test from R&D Systems (USA) and ELISA kit from Aviscera Bioscience (USA). 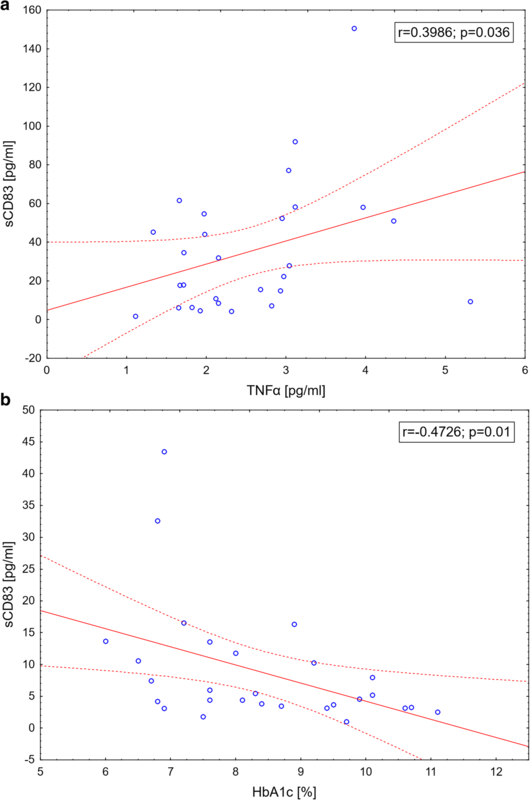 The minimum detectable concentration for TNF-α and sCD83 was 0.106 pg/ml and 3.125 pg/ml respectively. STATISTICA ver. 12 (StatSoft Inc., USA) was used for all the statistical analysis. Data comparison between the groups was done with the Mann-Whitney U test. The Wilcoxon signed-rank test was used for paired data comparison among the groups. Correlations were assessed using Spearman’s rank test. The results were presented as a mean ± standard deviation or median and 25th/75th percentiles. P values less than 0.05 were considered as significant. The concentration level of the sCD83 in plasma of patients with long-standing diabetes mellitus type 1 (LS-DM1, n = 28) were statistically lower (p = 0.00007) in comparison with the healthy controls (n = 15) and newly diagnosed children (ND-DM1, n = 28, p = 0.00001). No significant differences in the sCD83 plasma levels were found between ND-DM1 children and healthy controls (p = 0.79). Both LS-DM1 (p = 0.000002) and ND-DM1 children (p = 0.000000004) showed statistically higher TNF-α plasma concentration in comparison with the healthy volunteers. ND-DM1 children showed higher TNF-α plasma concentration in comparison with LS-DM1 children (p = 0.00059). When comparing the sCD83 plasma level with TNF-α plasma concentration in ND-DM1 children, we found a significant positive relationship (r = 0.399, p = 0.036). Moreover, the LS-DM1 patients with a lower sCD83 plasma level showed higher HbA1c (r = − 0.473, p = 0.01). We did not find any significant correlation between plasma sCD83 and the patients’ age or duration of the disease in DM1 children (Table 2, Fig. 1). In the healthy controls (n = 11), after 72-h-lasting PBMC in vitro culture, most of the examined cells in the monocytic gate (the median frequency of these cells was 70.49) showed surface expression of both CD14 and CD16 markers as well as the CD83 molecule. We have also observed that 72-h-lasting PBMC culture is a favorable condition for the CD83+ cell differentiation in ND-DM1 examined children (n = 10) (median percentage of CD83+ cells was 72.1). In the LS-DM1 patients (n = 30), the same PBMC culture setting allowed the differentiation of the much less CD83+ cells in comparison with the healthy controls (median value was 14.82). The results are presented in Table 3. We also examined the surface mCD83 kinetic expression, to check if there is an upward trend in the production of this important molecule in non-stimulated PBMC in vitro cultures. The mCD83 surface expression, defined as MFI, was examined at two time checkpoints: 24 and 72 h in unstimulated PBMC culture. Results showed that the mCD83 MFI level significantly increased from 24 to 72-h cultures in all examined children. The effect of TNF-α stimulation on the mCD83 molecule expression on the examined cells was also analyzed. Our results showed the reduction of the examined CD83+ cell percentages in all the study groups, as well as the mCD83 surface expression in both the healthy controls and ND-DM1 children. In the LS-DM1 patients, the differentiation process was not affected by TNF-α addition. Results are shown in Table 4. Upregulation of the surface mCD83 expression levels is a typical feature of the dendritic cells (DCs) differentiation process . The CD83 is also expressed in monocytes, macrophages, or immature dendritic cells. Cao et al. suggested that the CD83 is stably expressed only on the surface of matured, activated DCs, in contrast to activated monocytes, which transiently express this molecule . The soluble form of this molecule, the sCD83, is present in normal human serum  and may exert the immunosuppressive functions [17, 21]. The sCD83 binds with high affinity to the TLR4 coreceptor MD-2 (myeloid differentiation factor-2), which creates the TLR4/MD-2 complex. The interaction between the MD-2 and sCD83 may switch the inflammatory profile into an antiinflammatory one and effectively inhibit T cell activation . There are few works supporting the protective role of the sCD83 molecule. Zinser et al. have demonstrated that the sCD83 may highly decrease the brain and spinal cord leukocyte infiltration process in a murine model of autoimmune encephalomyelitis. The authors confirmed the suppressive role of the sCD83 in vivo and suggested its potential to be used as a new therapeutic tool . In addition, the study of Ge et al. confirmed that the sCD83 safely contributes to the tolerance development in case of cardiac allograft rejection . Moreover, its beneficial role in corneal allograft survival and Foxp3+ T cell upregulation was also determined . Results of Ju et al. led to a conclusion that mCD83 derived from human DCs has a crucial meaning in the stimulation process while sCD83 released by monocyte-derived cells seems to be involved in suppression development . Our study has shown that in all the examined patients, monocytes from PBMC cultures, not stimulated with exogenous cytokines, were able to show a surface CD83 expression and it was upregulated between 24 and 72 h of incubation. Interestingly, its levels were much reduced in the LS-DM1 patients, while in the ND-DM1 subjects, it was upregulated in comparison with the healthy controls. Additionally, we have revealed a reduction in the number of the cultured monocyte-derived CD83+ cells (moCD83+) in the LS-DM1 group. Our in vitro study revealed that the TNF-α stimulation had no significant impact on the mCD83 monocytes’ surface expression in LS-DM1, while it significantly worsened the mCD83 levels on monocytes from the ND-DM1 juveniles and healthy controls. As far as we know, there are no studies showing altered sCD83 plasma levels in the DM1 juvenile patients, depending on their stage of the disease. The sCD83 plasma concentration was much more reduced in the LS-DM1 subjects than in the healthy ones, and it was coincident with the higher HbA1c rates. In contrast, the elevated sCD83 levels were observed in some immune disorders. The sCD83 has been suggested as a potential marker for disease activity in multiple sclerosis , and others proposed it could modulate an enhanced immune response in rheumatoid arthritis [12, 13]. Moreover, its prognostic significance was suggested in some haematological malignancies . Surprisingly, we have shown TNF-α plasma concentration coincidence with the sCD83 levels in the ND-DM1 patients. So far, it’s hard to explain this observation, but, we suppose it may be connected with the process of monocyte activation and the autocrine loop effect of those molecules. Previously, an enhanced number of the CD16+ monocytes producing TNF-α  in diabetic children was revealed  and the sCD83 may be released from activated monocytes and the monocyte-derived dendritic cells (MoDCs) [17, 21, 37]. The study of Chen et al. showed that the CD83 counter receptor is mainly expressed on monocytes  and in vitro stimulation of CD14+ monocytes with the sCD83 increases not only the antiinflammatory IL-10 but also proinflammatory TNF-α production . Others claimed that PGE2 (Prostaglandin E2) production increases in sCD83-stimulated monocytes, while no enhanced IL-10/TGF-β release was noted . We conclude that the elevated TNF-α plasma levels in ND-DM1 children might in turn diminish the monocyte mCD83 production, a putative source of sCD83, as the disease develops. On the other hand, a possible role of enhanced TNF-α production on the mCD83 receptor cleavage in PBMC cultures ought to be taken into account, but further research should be performed. Taking into account a chronic and inflammatory character of type 1 diabetes revealed a decrease in the sCD83 levels and defective upregulation of the mCD83 levels on the cultured monocyte-derived cells, our results may indicate loss of the CD83 role as an immunosuppressive agent during disease progression. We propose that the sCD83 administration may have a potential to indicate a new therapy approach of long-term diabetes. This assumption should be confirmed by further in vitro studies. The study was approved by the Ethics Committee of The Medical University of Gdańsk (NKBBN/406/2013) and followed the principles of the Declaration of Helsinki. From all the parents of juvenile participants, written informed consent was obtained.